Thames and Kosmos is well known for developing useful toys for kids to learn new skills, especially with STEM topics in mind. 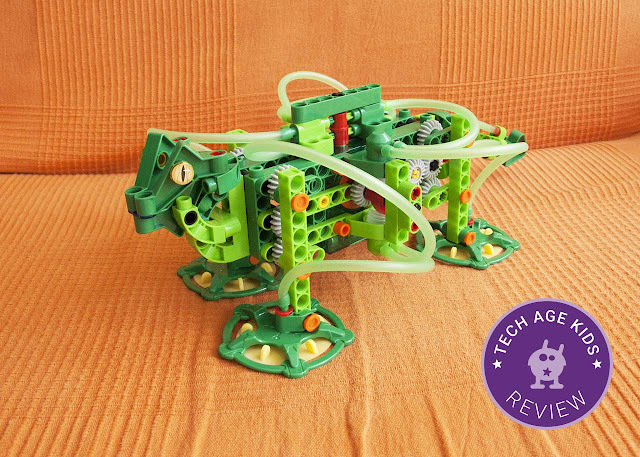 In this post, we reviewed the Geckobot Wall Climbing Robot and share our experience building with the kit. Disclaimer: Thames & Kosmos sent us the Geckobot kit to review. Our views and opinions are always honest and our own. The Geckobot is a robotics construction kit, which uses a motorised air suction system to power the models. The main model to build is the Geckobot but you can also build 6 smaller models with the same kit. 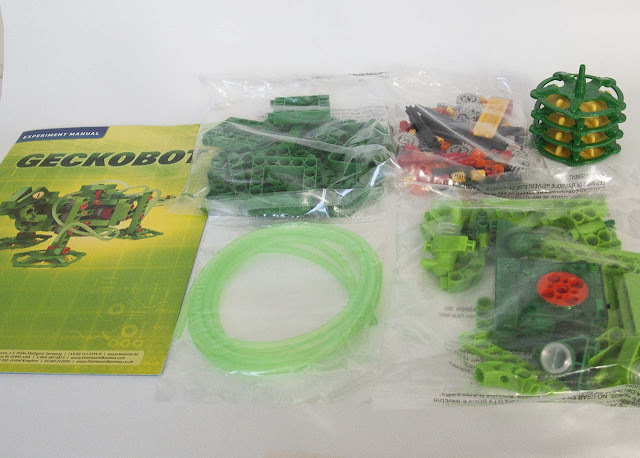 The Geckobot kit comes in an unusable large cardboard box with the contents only filling up half the box. It certainly makes for an impressive gift size, but not useful for storing the small bits at home. All the parts are individually packaged in plastic bags and you also get a comprehensive instruction manual which includes additional information and useful tips and well worth looking at before starting your build. If you don't want to loose tiny pieces, I would HIGHLY recommend you get a plastic storage box or tin to keep everything together. Before you start building any model, cut the 200 cm length of tube included in the kit, into the right lengths. My kids really enjoyed doing this and I helped them check the length before we cut. There's only 4cm extra length, so you need to be accurate! My next recommendation would be, don't build the Geckobot first! (see more tips for parents below) First get used to building with the Thames and Kosmos construction bricks and connectors using a smaller model. When you're ready to attempt the Geckobot, Thames and Kosmos created a 25min step-by-step construction and troubleshooting help video. I would definitely recommend you watch this video before you get started with building the Geckobot. The construction pieces look similar to LEGO Technic but the building experience is different. Pieces seem much harder to push together, this could be because the kit is new and virtually impossible to pull apart. There's a yellow tool in the kit specially made to take pieces apart. Don't loose it, because you're definitely going to need it. We made a lot of mistakes in our build and had to take pieces apart. The kids really struggled and I ended up having to help quite a lot. The pieces are colour-coded, so it helps to make finding the pieces easier. When we build as a family I am often allocated the role of "brick finder" whilst the kids follow the instructions and build. I did have to support my 6-year-old a lot with pushing the pieces together. He's very good at following building instruction but did struggle a with figuring out the orientation of the model in the instructions vs the model in his hand! 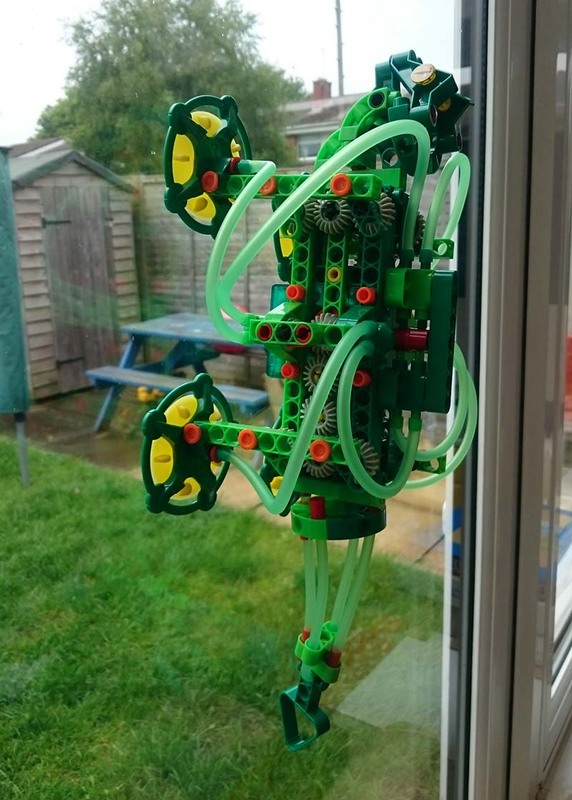 The Geckobot is the main model and uses all the pieces in the kit. It is also the most time-consuming model to make. It's the first one in the manual, but we highly recommend you build some of the smaller models FIRST before attempting the big build! You can make 6 other models using the same kit. Every model uses either motor or suction cups or both. You'll need to break up a model to make another one. 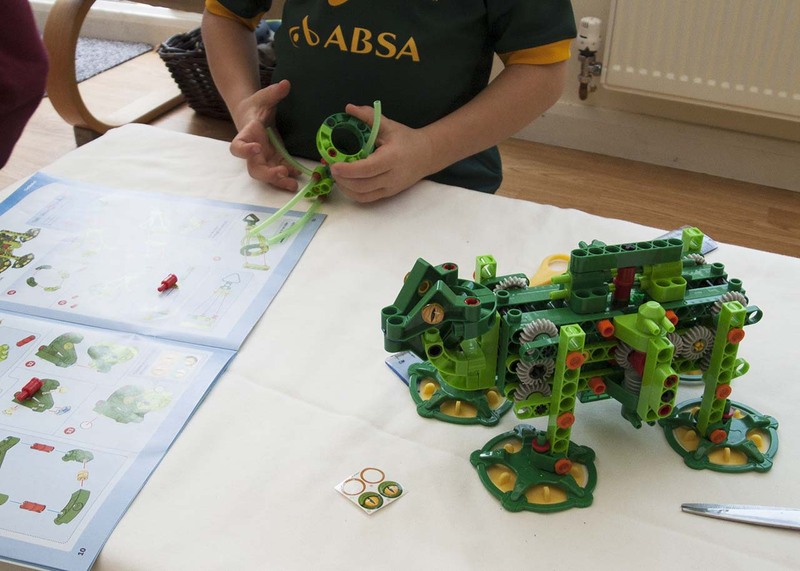 We highly recommend you build some of the smaller models before you attempt the Geckobot. 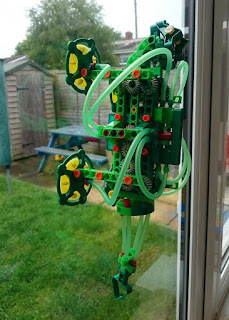 My boys decided to build the suction gun after we got too frustrated with troubleshooting the Geckobot. They enjoyed the experience a lot more and it worked as intended. Unfortunately it got broken up before I could get a photo! The motor needs 2 AAA batteries and they are not included in the kit. You will also need a tiny screwdriver to open the battery compartment. I didn't have one the right size and had to find a specialist toolkit which had the right size. You can use rechargeable batteries with the Geckobot and again we highly recommend it. The air suction uses a lot of power and you go through batteries like sweet cakes. The rechargeable batteries also seemed more powerful and we achieved better movement with the Geckobot. The suction was so great, it wouldn't come off the window! 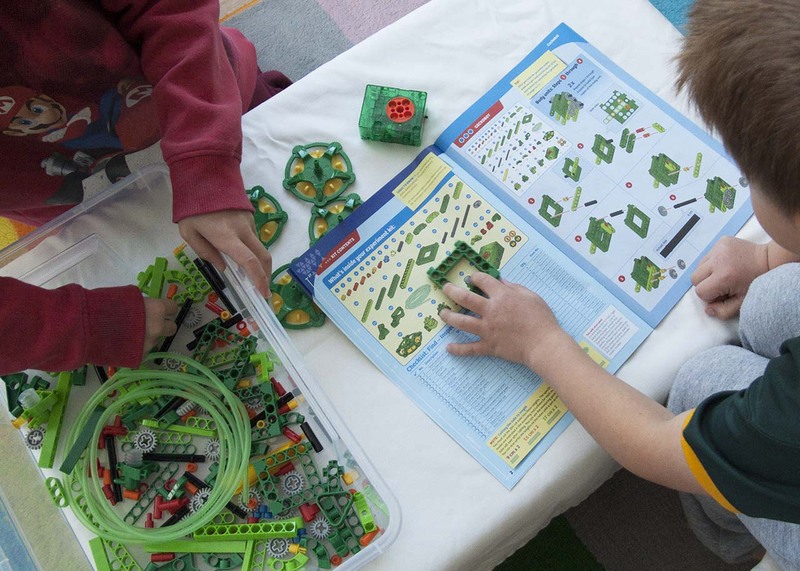 The Geckobot kit is recommended for ages 8 and up. I would say 8 is probably a bit young. A very able and determined 8 year old may get on OK with this model, but we think 12+ is more appropriate for building independently. There's a lot of troubleshooting required to get the movement right for the Geckobot and younger children will lose interest or get frustrated, unless parents have the patience to help. It is a good challenge for an older child, that can persevere to get the movement right. The Geckobot model is good to build in a team. My 8 and 6-year-old each built the same pieces (nearly all the sections are doubled up), with me helping and guiding and finding pieces. My 6-year-old didn't have the dexterity to push the pieces together properly or fit the tubes in place. Build some of the smaller models first to get used to the construction method and successfully complete a model in a shorter time frame. Opt for rechargeable AAA batteries and make sure they are fully charged. Standard (alkaline) batteries seem to run out VERY fast. Build together as kids are much more inclined to keep going with some adult support. Cut the tube the 200 cm tube to the right lengths BEFORE you start. 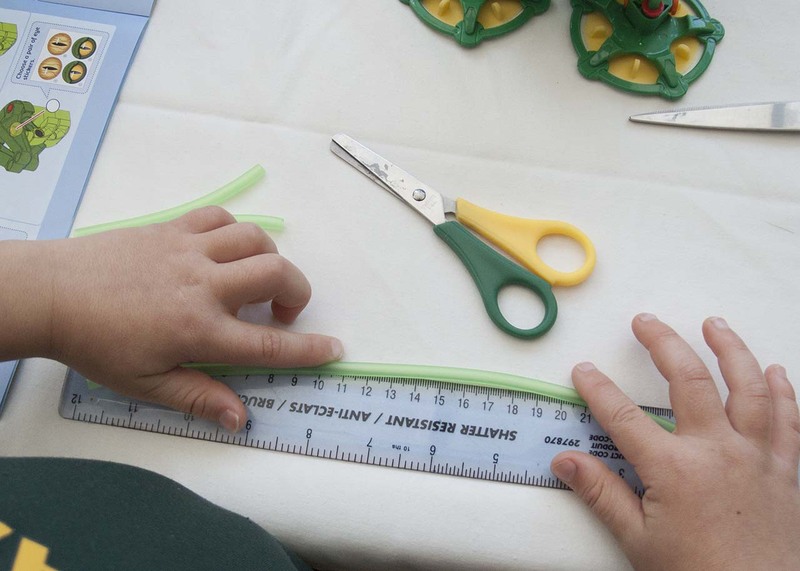 Kids can help by measuring the lengths and cutting. Each model will use variations of the different lengths of tube. The little yellow tool is your friend - use it to take pieces apart to save your fingers and nails! 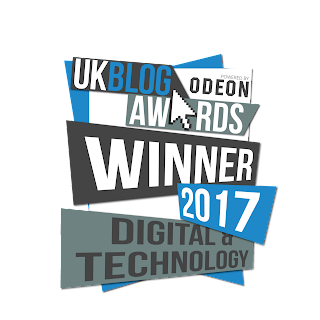 Use online resources to help with building and trouble shooting - we didn't find the manual clear enough to explain it. 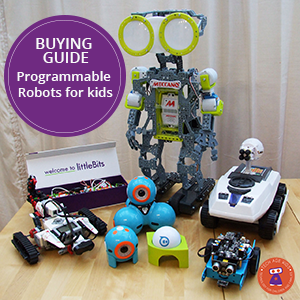 The Geckobot is an affordable kit with lots of build options. If you buy this kit, build a smaller model first! It was very frustrating to get the Geckobot to walk up a wall / window. 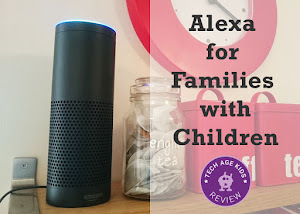 Unless your kids are super interested in how things work, they may lose interest fairly quickly, especially as the Geckobot model takes some time to build in the first place and troubleshooting the walking can take up even more time. In the end we couldn't get the Geckobot to walk properly up the window. We couldn't get the timing of the movement and suction just right for it to walk unaided! It's a good enough kit for older children and a cheaper alternative to other more expensive brands on the market. The product is good quality but the building experience is different. 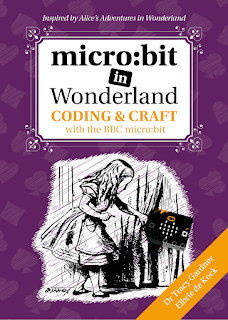 If you would like your kids to build this on their own we'd probably recommend it for older kids - able 10 year olds, or 12+.